FIFA's ruling council on Tuesday unanimously approved an expansion of the World Cup to 48 teams in 2026, with a format of 16 groups of three nations. "The FIFA Council unanimously decided on a 48-team WorldCup as of 2026: 16 groups of 3 teams," a tweet from FIFA's official account said. The decision marks a major coup for the body's president Gianni Infantino who has made enlarging football's showcase event the centrepiece of his young administration. The controversial proposal had faced criticism from some of the sport's most powerful voices, including warnings that it would dilute the quality of play and overburden already exhausted players. But Infantino had in recent weeks voiced confidence that his flagship project would be approved. The FIFA chief has noted that a bigger tournament would beef up FIFA's coffers. 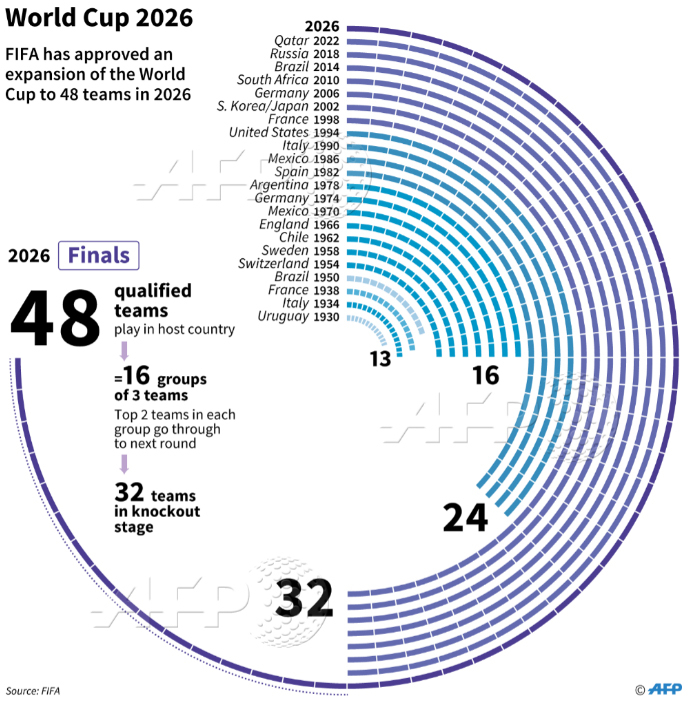 And a confidential FIFA report seen by AFP projects a 48-team tournament would bring a cash boost of $640 million above projected revenues for next year's finals in Russia. But Infantino has also argued that more World Cup berths would help drive football's global growth by boosting "inclusion" in the "biggest social and sporting event". Among those who seemed convinced by that argument was Argentine football legend Diego Maradona, who on Monday said a 48-team format "will give more possibilities to countries that have never reached that level of competition". Africa and Asia could be the big winners in a larger format with a rise in their number of places, currently at 5 and 4.5 respectively. But in order to smooth over scepticism about World Cup reform within UEFA, it is likely that Europe will also see its allotments rise above the current 13 places. A source close to FIFA told AFP that under the new format Europe could get 16 places, with Africa earning nine. But the information remained unconfirmed and world football's governing body was not expected to immediately announce its final decision on allotments. The powerful council officially weighed five proposals during Tuesday's meeting at FIFA's snow-covered Zurich headquarters, including maintaining the status quo of 32-teams. The landmark decision to expand the tournament is the latest overhaul of the World Cup, which has seen its global popularity and financial might surge since the inaugural edition in 1930. The World Cup expanded to 24 teams in 1982 in Spain before moving to its current 32-team version at France 1998. "The FIFA Council unanimously decided on a 48-team World Cup as of 2026: 16 groups of 3 teams," a tweet from FIFA's official account said.